What LORAC says about their Front of The Line Pro Liquid Eyeliner: "This high performing no-smudge no- budge, water-resistant liquid eye liner boasts a unique automatic delivery system that provides a clean, precise application. The flexible tip provides ultimate control, accuracy and smooth strokes, so you'll never miss your lines. From very fine to dramatically bold, this versatile pro will take you to the front of the line every time!" Of all the different types of eyeliners available, liquid is my preferred method for my upper lash line especially if I'll be doing a precise winged out look. Lately every makeup company has been coming out with their version of the ones in pen form which I think are the most convenient to use and more efficient for application as it can be held like a pen and it has it's built in applicator. Formulation: Nice and wet and not watered down. It doesn't irritate my sensitive eyes at all. The ink delivery is perfect so no shaking up to get the product to the tip to use and no overflow of product either. It also dries to set very quickly at the same time giving enough time to apply it. Pigmentation/Color Payoff: The payoff is not bad at all- it gives a nice crisp opaque line. It doesn't look washed out or see through but is definitely a little less harsh, I own blacker eyeliners. Performance and Versatility: Easy to use and control and very versatile- it's capable of applying an extremely thin consistent line and can then be built up to make a thick cat eye or any other look of choice. Variety: There are only two shades offered- the typical black or brown. It would be nice to have other color options to create all sorts of fun looks. Quality and Lasting Power: This eyeliner is truly waterproof. It lasts on my upper lash line from morning to night through it all. I don't find it to smudge, feather or wear off at all throughout the entire day which is quite impressive. Also, you get a lot of mileage from the product itself. I don't use it everyday, but I have used it plenty of times over the past few months and it hasn't run out or dried out yet. The Applicator: It has a unique fine tapered brush tip which is a dense but still quite gentle and flexible giving good control. It really gets into every spot of the lash line and is very convenient to fill in and cover the band when using false lashes. Packaging: The packaging is gorgeous with it's sleek gunmetal pen exterior and it's information etched into the side. Surprisingly, it doesn't pick up finger prints or dirt either which is nice too. On top of that it has a great airtight cap that keeps it from drying out. The price: I think $23.00 is quite pricey for a liquid eyeliner but it's worth the money since it performs very well and can last for a few months. This eyeliner is the finest tipped liner I have come across. I like that it lasts very nicely throughout the day and can be removed easily with a good makeup remover when needed. I also think the pen style applicator is very user friendly as it distributes the perfect amount of product. It's very versatile and can be used to apply a thin line for just a bit of definition or bolder liner for more intensity. It's definitely on the pricier side but worth it in performance. If you are looking for some interesting colors or the blackest of black eyeliners I wouldn't go for this one though. 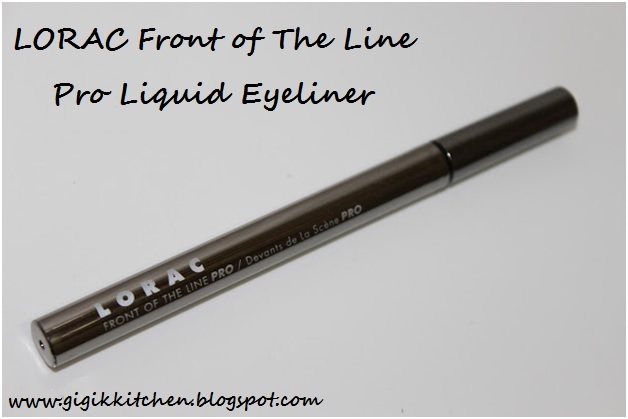 If you are going for a thinner line, you will want to drag the pointy tip along the lash line. For a thicker line, you can press harder, or push the base of the brush against the lash line building up the liner with each stroke. Have you tried this liquid eyeliner by LORAC? What did you think of it? Did you love it or loathe it? What's your favorite eyeliner? Let me know in the comments form below! I love read your sweet comments and get your recommendations!